When opened up, the G75VW feels fairly spacious. Although I’m not terribly fond of notebook keyboards in general, this notebook boasts one of the better examples of its kind. The backlit keys are well sized and spaced for my large hands, and there are no unpleasant surprises in the layout. Aside from training my left pinkie to reach out a bit farther to hit the CTRL key, I had no issues adjusting to touch typing on this keyboard. In a nod to this machine’s gaming focus, the W key has a raised dot on it similar to the longer bumps on the F and J keys. While this led to occasional hitches during touch typing sessions as my ring finger felt a bump it wasn’t expecting, in games it helped me to reorient quickly on the WASD cluster for movement without looking down. I’d venture that this little bump is worth more in terms of helping you stay in control in games than any amount of fancy backlighting; after all, your eyes should be on the screen. Though the keyboard is backlit, it doesn’t have the crazy multicolored lights and big chunky font of other gamer-oriented keyboards I’ve seen. The color scheme is a simple white-on-dark gray, with white backlighting and a fairly neutral font. The backlighting is a basic off-low-medium-high arrangement controlled by a couple of Fn+F-key chords, and lights up the whole keyboard evenly. It’s actually hard to tell it’s on when you’re in a well-lit room; in a darkened LAN party it illuminates the keys clearly without casting a glare on the screen. Speaking of Fn key chords, while most of them work pretty well, there were a few problems that kept bugging me. The Volume Up/Down/Mute key chords functioned inconsistently in full-screen games, sometimes working fine, sometimes not at all. In Steam games, I noticed that hitting Fn+F12 for volume up was also causing the Steam overlay to take screenshots, which indicates to me that the Fn key chords are implemented in software, rather than as a shift-layer in the keyboard’s firmware as they should be. Reassigning the screenshot key in Steam’s settings is an easy enough workaround, but it really shouldn’t be necessary in the first place. The Media Stop/Play/Previous/Next keys do not work as generic media keys as I expected them to. Instead, they’re all coded to launch and control the ASUSDVD program, which is just a re-skin of PowerDVD. If you’re looking to use them to control a music player program without Alt+Tabbing out of a full-screen game like I was, you’ll be disappointed. The touchpad is not my favorite. I’ve never been terribly fond of touchpads to begin with, and while this one works well enough, I kept finding myself picking at its edges with a fingernail, trying to pry up a protective plastic film layer that wasn’t there. That goes away over time, but the slick plastic feel takes some getting used to. 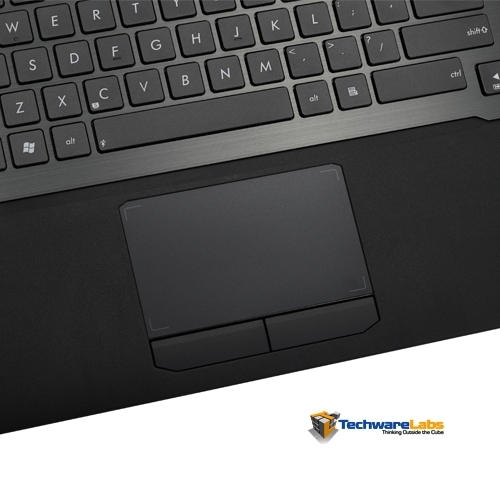 The physical buttons below the touchpad are solid and responsive, which is just as well, as the tap-to-click and two-finger tap gestures are inconsistent in how they respond. 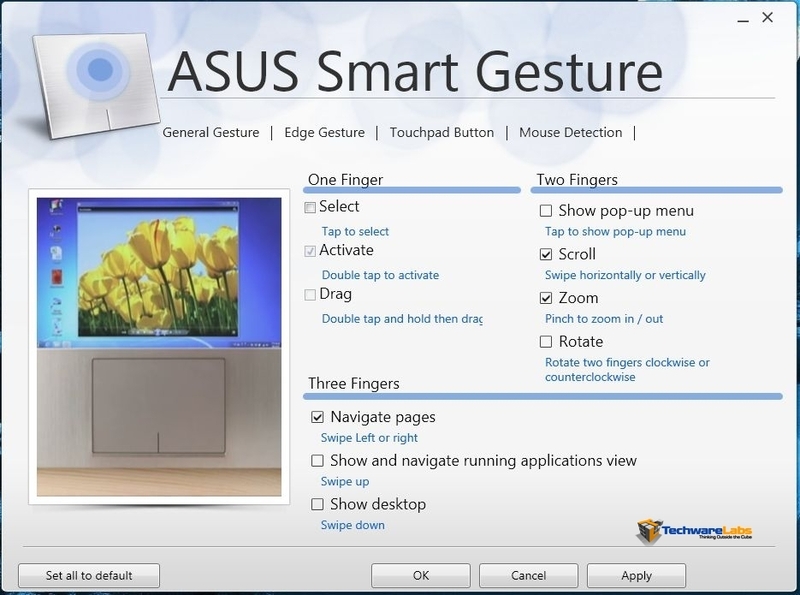 The ASUS Smart Gesture program lets you enable or disable gestures individually, but you can’t adjust their sensitivity or activation zones. Still, the program is a boon to anyone who dislikes tap-to-click or any of the two and three finger gestures. The edge swipe gestures peculiar to Windows 8 were particularly troublesome; I ended up accidentally activating them far too often, and needing them exactly never. One feature I did like was the mouse detection, which can be set to disable the touchpad when a USB or Bluetooth mouse is connected. Given how disastrous an accidental swipe across the touchpad would be in the middle of a game, this is a welcome feature. Why this was not on by default, I’m not sure, but it’s nice that the option is there. Obviously, if you’re using this system for gaming, you’re going to be using an external mouse more often than not. 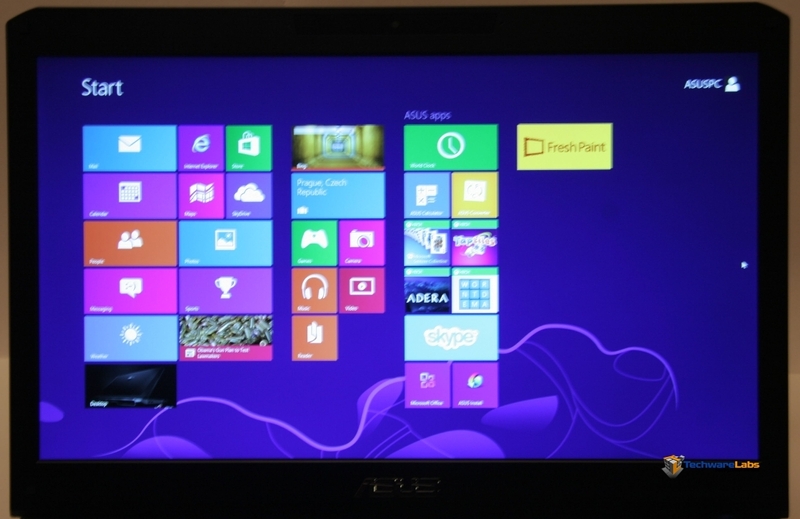 Given that, the edge gestures are less of an annoyance than they would be with a notebook with a more on-the-go focus. 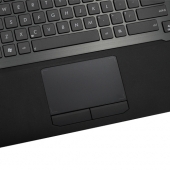 One major problem with ASUS Smart Gesture: it’s not easy to find. There is no desktop shortcut, no entry on the start screen, no control panel applet, no entry in Programs and Features, and absolutely no mention of it in any documentation. I found it by accident, when I was randomly double-clicking on icons in the system tray to see what would happen. This program needs significant improvement if it’s going to replace the standard Synaptics configuration tool, and should be exposed to the user far more prominently. What struck me immediately about this machine when turning it on was the screen. Though it obviously can’t compete with an IPS display in terms of color fidelity and viewing angle, the TN panel on the G75VW is one of the best examples of its kind I’ve seen in a while. The 17″ 1080p display is bright and crisp, with good contrast and saturated colors. In fact, it was a little too bright; as with many other monitors, I found myself dropping the brightness to below 50% before I was comfortable with it. The speakers above the keyboard are a bit on the tinny side, though they’re helped somewhat by the “subwoofer”, which is actually a slightly larger full-range speaker. The sound is clear, though never terribly loud. You’ll probably want to use headphones in anything noisier than an empty room. The built-in microphone is fairly good at picking out voices, though it’s not great at isolating the one coming from the person sitting in front of it. With an analog headset, the Via sound chip performed fairly well; the sound was clear, balanced, and free of the chirps and pops that would characterize poorly-shielded signal lines. I did hear a slight hiss coming from my headphones from time to time when nothing else was playing, though the driver minimizes this by muting the output whenever it sees that no program has used the playback device in the last second or two. 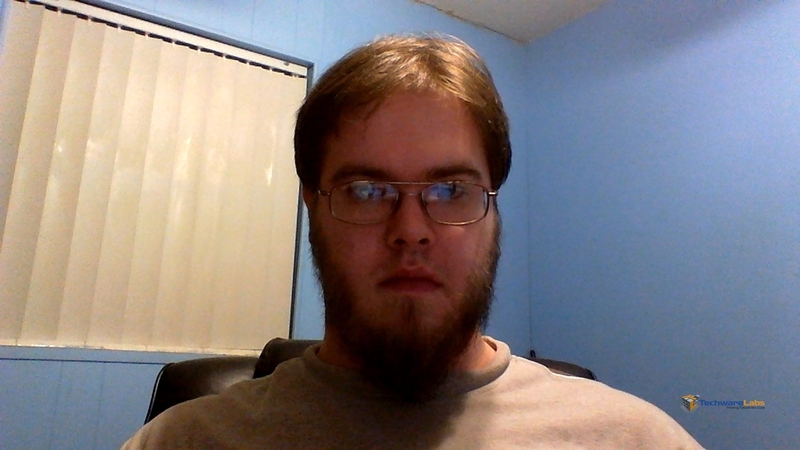 The webcam is rather poor. As you can see, there’s plenty of visual noise and fuzzing even under fairly bright indoor lighting, and it seemed to have trouble figuring out where to focus. 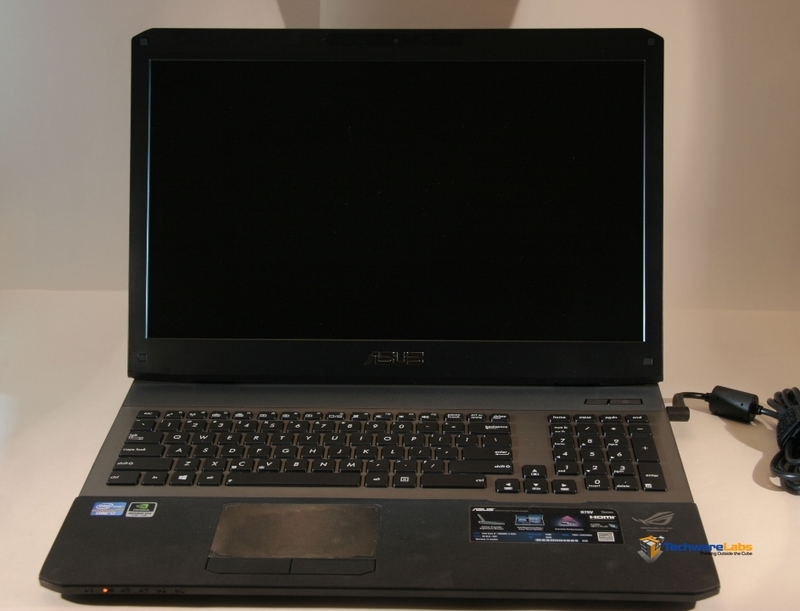 ASUS would do well to upgrade the optics and resolution on a laptop this high end. Battery life, though obviously not a major selling point on a desktop-replacement system like this one, was still fairly respectable for a laptop of this size. I was able to get about 4.5 hours of web-surfing, including a fair amount of YouTube video watching, out of the battery before it interrupted me with the critical battery alarm (6% charge remaining). Doing nothing but full-time HD 1080p video playback, I got just over 2.75 hours before reaching the same point. Suspend and hibernate operations both happened fairly quickly, though semi-frequently the lock screen would come up, but not respond to inputs for several seconds, making me think the system had hung on resume. Hopefully this will be addressed in a software update. Love the features actually. Sleek and fast, this is just what I need.